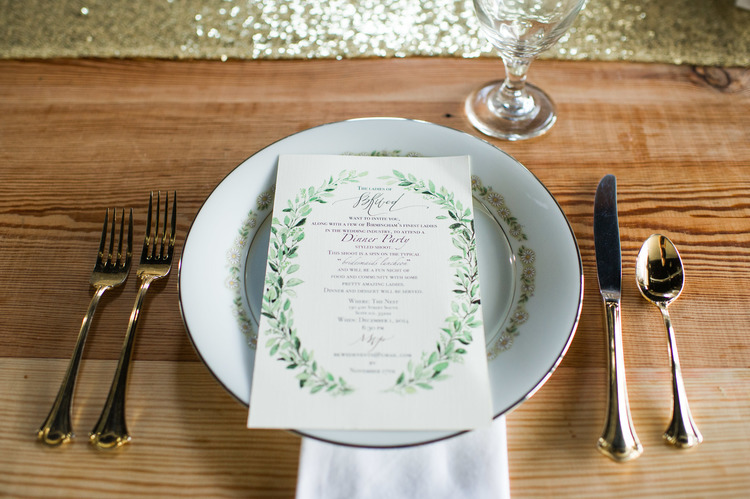 On December 1, 2014 BKwed hosted a Bridesmaid's Dinner Styled Shoot at The Nest. The guests were some of the very talented Birmingham Area Wedding/Events Vendors. It was a fun night filled with food, flowers, friends and laughter. Most Bride's have bridesmaid's luncheons and so we wanted to suggest a Bridesmaid's Dinner as a fun girl's night out. Many thanks go to Kristen Hall, owner of The Nest and also known as the Baking Bandit. Kristen opened her beautiful venue to us and also provided the most wonderful pastries for dessert. Savoie Catering provided the most delicious appetizers and dinner. Kelly Cummings of Spindle Photography captured the night with her beautiful photography. Brittany Sandretto used her talent with hair and make up to make our models even more beautiful. Our models were Sarah Brown, Katelyn Meadows and Paula Coldiron. Mike Nelson of Aabco Rents provided the beautiful gold flatware for our table settings. Abby Little of Reflect Visual Arts painted reflections of the event. Sarah Brown created our beautiful invitations and also the place cards for the table settings. All florals and table settings were done by BKwedevents.